(which I'm not), I might quit my job over the latest "God's not Dead" movie craze. Even my heart hurts wondering why Christians get excited about a movie but aren't equally moved by a sermon? The following is an excerpt from the movie's website describing the anticipated impact of the movie. GOD’S NOT DEAD weaves together multiple stories of faith, doubt and disbelief, culminating in a dramatic call to action. The film will educate, entertain, and inspire moviegoers to explore what they really believe about God, igniting important conversations and life-changing decisions. Doesn't your pastor attempt to deliver the same motivation every week at your place of worship that the movie delivers ONCE? Can you imagine how a pastor might feel? Pastors don't give up and won't quit. I've considered discontinuing my weekly devotional on this blog due to it's lack of readership growth but I simply can't find a stopping place. I do question my writing abilities though. I wonder how to (what's the words they use) culminate a dramatic call to action. Please consider a facebook share or shout out on twitter! The Duck Dynasty family was a box office draw for the movie. Will and his wife had a special appearance. The Dynasty Crew makes duck calls that imitate a duck's voice. Duck calls invites other ducks to come and usually meet their demise. John 10:4-5 And when he putteth forth his own sheep, he goeth before them, and the sheep follow him: for they know his voice. And a stranger they will not follow, but will flee from him: for they know not the voice of strangers. Do we use our voice to call people to Christ or do we just try to imitate Christians? Do we camouflage our faith? 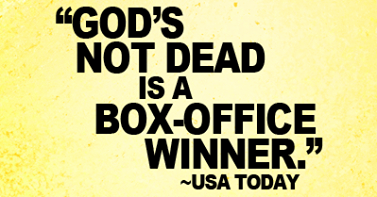 USA Today says "God's Not Dead is a box-office winner". Is it a soul winner too?